Taxi firm Uber has been accused of ‘robbery’ after the company tripled its prices to cash in on the traffic chaos caused by the biggest London Underground strike in 13 years. Uber users tweeted their anger at the online taxi company, expressing outrage as taxi fares rose by up to 300 percent at a time when thousands of Londoners were struggling to get to work. “Demand is off the charts! Fares have increased to get more Ubers on the road,” the app stated. London commuters described scenes of “absolute carnage” as the city grapples with a 24-hour tube strike which was called by several transport unions in response to unresolved disputes over the introduction of night tube services in September. In response to the surge in demand, Uber raised its minimum fare to £14.50 (US$22.30) with an additional fee of £3.62 per mile. If the cab is stuck in traffic, passengers must pay an extra 43p per minute. Prices began rising from 5:30am as commuters ordered cabs early to avoid the traffic. “I hope London’s black cab drivers take advantage of this and get additional fares today to help Londoners out,” London Mayor Boris Johnson told LBC Radio. Despite an extra 200 buses and additional river services being laid on, many commuters still experienced long and difficult trips to work. Commuters tweeted pictures of “chaotic scenes” as people attempted to board packed buses. In one instance police were called when a driver refused to continue his route because the bus had too many passengers. Large crowds reportedly built up around the busiest Underground stations on Wednesday evening as commuters attempted to beat the strike, which began at 6:30pm. The Victoria and Northern lines were temporarily suspended and Oxford Circus station was intermittently closed while Transport for London (TfL) tried to control passenger flow ahead of the industrial action. A spokesperson for the Metropolitan Police said authorities should factor disruption into their policing. Other twitter users saw the bright side of having to walk to work on a sunny July day. Never seen so many people in the streets walking, happy in the sun. Maybe there should be a #tubestrike more often than there is already! #TubeStrike Have a walk. Borrow a bike. Stop whinging. According to London Underground, the tube network handles up to 4 million journeys each day, with more than 535 trains in operation across the service at peak times. Around 20,000 Underground staff are on strike as a result of an ongoing dispute over pay and rosters for the all-night weekend tube services planned to start in September. Talks between London Underground and four transport unions, including RMT and ASLEF, broke down on Tuesday evening after both sides denounced each other’s negotiating tactics. “Despite strenuous efforts by union negotiators to press London Underground to address the issues of fairness, safety, work/life balance and equality at the heart of this dispute, they have come up with nothing in the talks,” RMT General Secretary Mick Cash said. 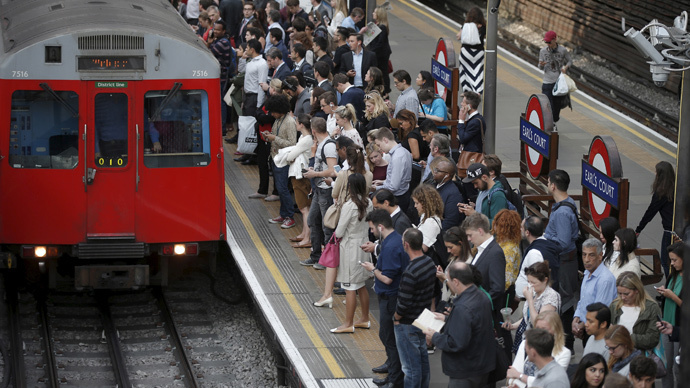 “The responsibility for this strike and the disruption that it will cause rests squarely with London Underground management,” ASLEF District Organizer Finn Brennan said. “They squandered the window of opportunity to resolve this dispute by refusing to move their position in the slightest for three months and then demanding that all four trade unions accept an offer in one afternoon. “We will be ready to return to the negotiating table on Friday morning to ensure that further action can be avoided,” Finn said. Transport Secretary Patrick McLoughlin described the strike as unnecessary and said it benefited no one. “We stand shoulder-to-shoulder with workers, families and commuters who want to go about their lives without disruption. I urge the strikers to accept the good offer that employers have made and get back to work,” McLoughlin said.